Dahon, the world leader in folding bicycles, will be demonstrating its latest line of personal electronic cycling accessories at the 2010 International Consumer Electronics Show (CES) in Las Vegas from January 7-10, 2010. Dahon will be featuring these products as well as its latest award-winning urban-cycling platform at the booth of MiniWiz, its consumer electronic accessory design partner. On display will be Dahon¼s BioLogic ReeCharge. The BioLogic ReeCharge, developed together with MiniWiz, is a portable battery-pack/charger that uses the excess energy generated by a dynamo hub while cycling to power most portable consumer electronic devices that can be charged via a USB port, including iPhones, iPods, cell phones, and GPS devices. "As bikes play an increasing role in transportation, there is a greater need for them to integrate with our everyday lifestyle," stated Joshua Hon, Dahon vice-president. "And that includes our need to power mobile gadgets. The ReeCharge, which comes standard on our Ios XL and Speed TR models, allows people to tap into the free, green energy they generate with a dynamo hub to power their personal electronic devices. We expect this type of functionality to become more important as more people take to cycling as part of their everyday routine." Also on display at the MiniWiz booth will be Dahon¼s BioLogic Bike Mount for iPhone, a weatherproof case for iPhones that can attach to a bicycle or motorcycle handlebar. 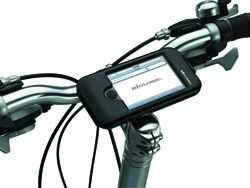 The Bike Mount for iPhone features a silicone liner that prevents water ingress while providing shock resistance. A welded touch-sensitive membrane allows full touchscreen functionality. The mount also pivots so riders can use their iPhone in portrait and landscape modes. The Bike Mount is designed to work with the ReeCharge so people can run iPhone apps that use GPS while riding, without worrying about running out of power. Dahon's BioLogic ReeCharge, BioLogic Bike Mount for iPhone® and Ios XL folding commuter bicycle can all be seen at MiniWiz¼s booth - North 4410. BioLogic cycling accessories and components are designed for urban mobility. BioLogic, Dahon, and ReeCharge are trademarks of Dahon. Apple®, iPod®, and iPhone® are registered trademarks of Apple, Inc.
Dahon is committed to creating green mobility solutions for people who live active, environmentally friendly lifestyles. In 1982, Dahon ignited the folding bicycle revolution with the introduction of the Dahon Folder, the forefather of the modern-day folding bicycle. Dahon is the world leader in folding bicycles and is headquartered in California, with factories and offices in Taiwan, Macau, China, and the Czech Republic.